Live from Gen Con, we are pleased to announce the release of Titansgrave: The Ashes of Valkana in print and PDF format. We are running a Pre-Order Plus special on the book for a limited time, meaning when you pre-order Titansgrave, we’ll offer you the PDF version for just $5 at Checkout. The same deal is in effect for Fantasy AGE Basic Rulebook, which you also need to run your own Titansgrave campaign. You watched the show; now play the game! Titansgrave: The Ashes of Valkana is Wil Wheaton’s new tabletop RPG show on Geek & Sundry. It introduces an original science fantasy setting that mixes high magic and hi-tech. Written by a stellar team of award-winning designers, this companion book for the Fantasy AGE RPG gives you background info on Titansgrave, and all the adventures you saw on the show. The adventures include new encounters and options that will let you make the story your own. So grab your blaster and ready your spells. Titansgrave needs heroes! 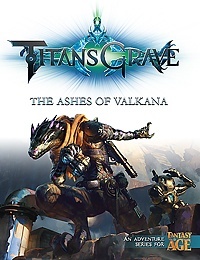 Pre-Order Titansgrave: The Ashes of Valkana today!